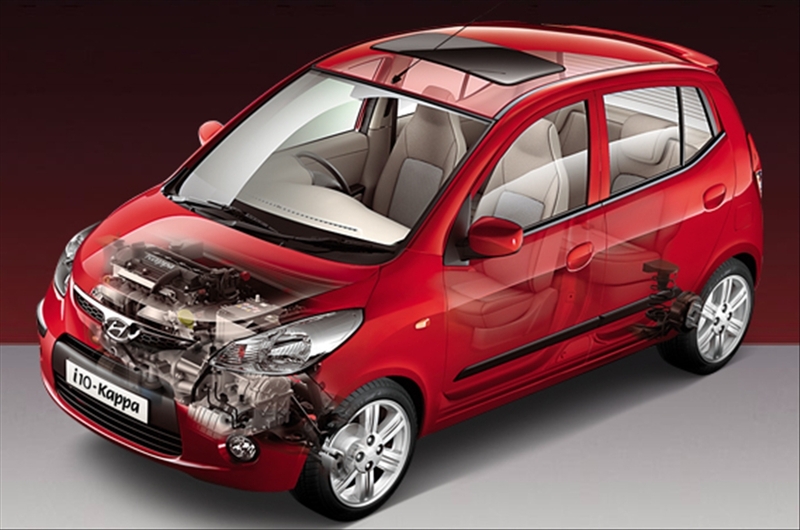 Hyundai has unveiled the i10 Kappa. While most of the exterior specs are the same as before, the new car comes with an all new, in-line 4 cylinder 1.2 litre advanced Kappa engine, which seeks to deliver greater operational efficiency in terms of both fuel consumption and emissions. The Kappa i10 comes in three variants, Magna, Sportz and Asta, the last named being the top end model with all the goodies, and will be available in 10 colours. You can compare features across all variants here. The other feature that has been added is a 4-speed auto transmission. I’ve actually been toying around with the idea of acquiring an ‘auto’, given the stop-go bumper to bumper traffic that is part of our daily grind now. In India, however, most people prefer a manual gearbox due to greater fuel efficiency, but I believe that if you know how to drive an automatic, you can get some pretty good consumption figures. There aren’t too many small cars in this space though with Santro being the only one that’s selling some decent numbers. The i10 Kappa automatic is available in Pune at Rs.5.09 lakhs (Magna), Rs.5.37 lakhs (Sportz), and Rs.6.20 lakhs (Asta), all on-road prices.